In the Mongol Rally there is no set course—you choose whatever path you like. This leads to some teams choosing the southern route (Turkey, Armenia, Iran, etc. ), and other teams choosing the northern route (Ukraine, Russia, Kazakhstan). This brings a whole new twist to the race. In a way picking the course is like being dealt a hand in texas hold em poker, you don’t know what you’re going to get but you have to keep on playing. we have chosen the southern route for our team. As much as I’d love to visit Finland and the baltic countries, we’re going to go the ‘not so easy’ route, which just so happens to also be the cooler route (not-climate-wise). After weeks of research, map inspection, blog post reading and commenting; I’ve gone ahead and planned with a certain degree of precision our route from Chichester near London all the way to Ulaanbaatar, Mongolia. This map is awesome, and really shows the distance and scale of the land we’ll be covering. Measured on the map, we will be driving a more than 16,000kms through 19 countries in a car that even Mickey Mouse would say is too small– a 1.2l engine auto. Below is a picture of a rally car from 2009, ours will be very similar. It is not definite although it should cross some of the most breathtaking, remote and magnificient landscapes central Asia has to offer. This journey is punctuated by stop in cities with fabled names such as Baku, Ashgabat, Samarkand, Osh and of course Ulan Bator. Our route is a bit of a melting pot of the familiar, the unfamiliar and the ‘where the hell are we?’. Good roads, bad roads and no roads. We can’t wait to get on it! From Goodwood, leaving England and the white cliffs of Dover we are heading to Bruges for the night. arriving at Klenova for the crazy Czech out party. All the way to Istanbul. We race through Europe while the Tarmac still holds. Stop in Galipoli and couple of days in Istanbul to discover the city and have the last real fix (car + visa) before hitting the wild. A small detour via Cappadocia, drive through Georgia. Have jolly dining of famous georgian food, porc meat and georgian wine before hitting Azerbaijan and its capital Baku. We are now official in the real deal! Turkmenistan is one of the most lockdown country in the world. Nevertheless, team Adventourists fear nothing and head straight to the Door of Hell! and up to Nukus. Uzbekistan and its fantastic cities of Khiva, Bukhara and Samarkand. Timurid architecture, Holy cities and tea houses await. Heading to Dushanbe, Tajikistan we take on the road heading to the rooftop of the world. 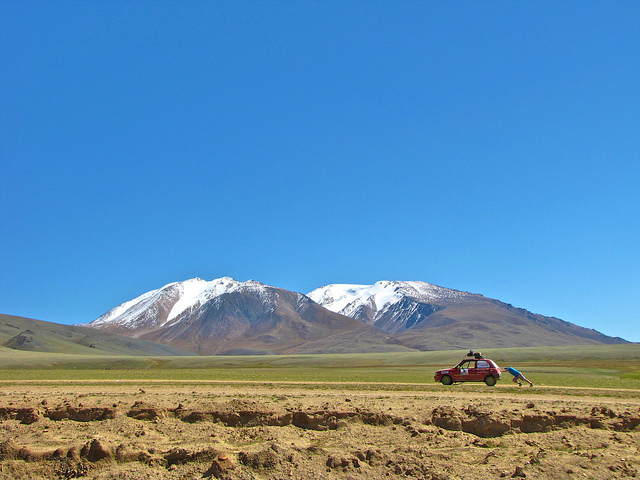 Driving through the Pamirs is one of the most reknown driving adventure in the world and facing a remote wilderness a 4,000m high in a tiny car is certainly a challenge! driving down from the mountain, we hit the 3 millenium old city of Osh, Kyrgystan. From there our path takes us to the biosphere of Issyk Kul and Karakol for a salty bath in one of the highest lake in the world. We are now entering the almighty Mongolia, land of Genghis Khan. Our travel speed has fallen from 1,000 kms per day to barely 250kms in prevision of the dirt track we will be hitting there. Ulaanbaator!!! We made it! Till the last finish line party it will be horse riding, visiting the Children’s centre, RPG firing and tank driving! Yup, that’s what we’ll be doing this summer, driving across 1/3rd of the distance around the earth. Find more about the Adventourists Team, Find out for which Charities we are doing this trip or simple browse through our blog which will contain pre-mongol rally preparation tips or on the road live coverage.